Will proved best at nearest the pin in 2, whilst Chris V. was nearest in 1. I will try to fix the dates for 2018/19 as soon as poss, although some courses won't have their costs organised yet. After a few found the traffic a little delaying, the 21 players all arrived for their bacon roll and coffee. We couldn't believe the sun was out, there were raked bunkers, bouncy fairways and pretty true greens. A bit of a novelty we thought!! The 113yard par 3 , 10th hole was chosen for the nearest the pin and Les Polden took full advantage. I think we all agreed that the course was in excellent condition and 8 players had 30 or more points. I will be putting up the entry sheet next week. We have had 40 players during the 3 meeting and I hope to see the 30 player sheet as full as possible. Our 30 intrepid seniors found their way to Toot Hill, o.k. although one, Dave Skinner, couldn't find the entry door to the club to liberate his bacon bap. 15 new names joined for the event, making 38 players this year and I would like to thank Joe Hardy for making up the 30 players at short notice. 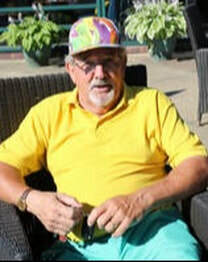 Barry, of course, knew everyone he met, having been a member, so we sent him off first as the lead "scout"
"Ready Golf" was evident, as the first 2 groups were round in under 3 and half hours. The course was in very good condition for early November with greens and fairways nicely mown. The rough, however, was most appreciated, by most of the members, with it much more manageable than at Warley. Next March is our next meeting at Braintree with the April meet still to be finalised. 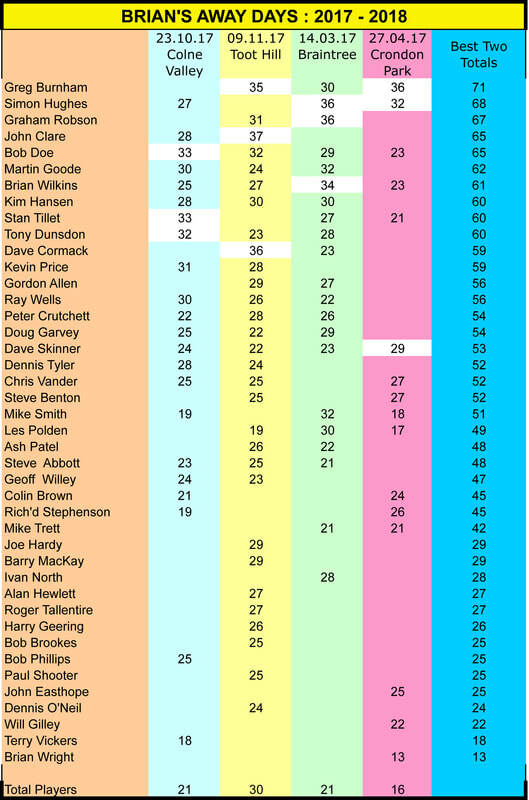 The table below shows the current leaders in the competition with John Clare & Bob Doe both on 65. John will be the wearer of the " Yellow Jersey " with his 37 points from yesterday, on best "back 18" basis.